Whether you are looking to avoid baggage fees or simply want to travel light, travelling carry on only can make life a lot easier. 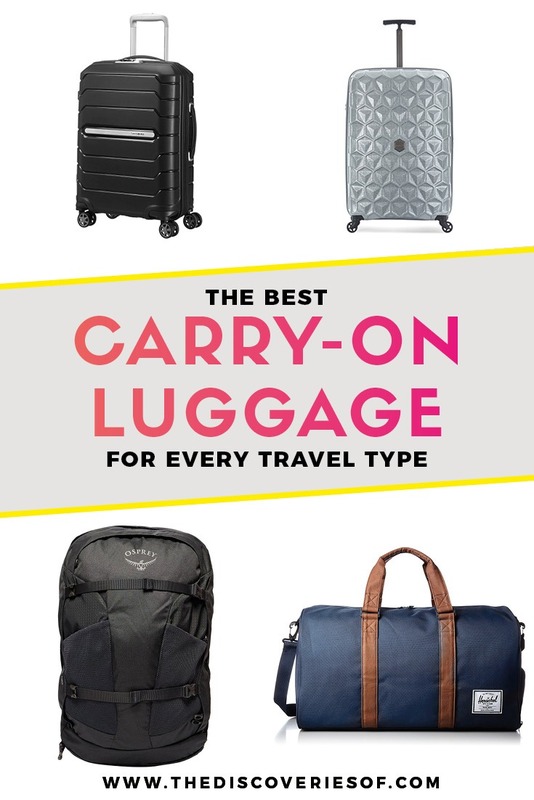 We’ve rated and reviewed the best carry on luggage for 2019 to help you choose. Samsonite Flux Spinner combines form and function for a stylish hand luggage case that is practical and durable. So what’s so special about it? Samsonite is renowned for its well-designed suitcases, but the Flux Spinner is the first expandable hard shell they’ve produced. It’s comfortable to transport and looks great too. The hard shell four-wheeled case has 360-degree double wheels for ease of transport. Its polypropylene shell is tough and wears well – managing to look brand new after several outings. The weather-resistant shell is sleek: its futuristic look stands out from the typical hard-shell case. It’s accompanied by a double tube handle that is comfortable to handle, even for long periods of time. Meanwhile, the lined interior has all of the practical solutions you’d expect from a Samsonite suitcase. The Flux Spinner boasts a zippable divider pad, a large hinge pocket and elasticated ribbons to help secure your items inside the case. With a 37 litre capacity (44 when expanded), it’s roomy enough for longer trips, particularly when combined with packing cubes. You can choose from a number of colours, more traditional ones include white, black and navy. Alternatively, opt for a splash of colour and opt for Tangerine Red or Ocean Blue. Pros: Expandable – helpful if you need more room. Very durable. Good selection of colours. 5 year limited warranty. Cons: Quite expensive. Quite heavy (2.6 kg). Dimensions: 55 x 40 x 20 cm. 55 x 40 x 24 cm when expanded (still suitable as carry on for most airlines). Antler Atom is the one for you. With its distinctive splash-proof honeycomb Armordon® exterior – this is one of the most stylish cabin suitcases available. Take your pick from three colours: silver, blue and charcoal – it looks just as good in all three. Unlike some other hard-shell suitcases, the Atom is lightweight, weighing only 1.9kg. Combined with its Hinomoto easy glide rotating wheels and grip handles, it’s every bit as practical as you’d want for your travels. Armordon is actually the same material that the British Army make their helmets out of. That tells you pretty much everything you need to know about the Atom’s durability – turns out, it’s a lot more than a stylish exterior. The Atom is the most expensive suitcase on this list. However, it also comes with an impressive 10 year warranty – this is a product that has been built to last. Pros: Very tough. Looks great. Lightweight. 10 year warranty. Revelation Nexus D is the best cabin luggage option if you’re on a budget. Revelation is actually part of the Antler family, so you can expect the same attention to detail and luggage expertise as you can from its pricier sibling. Revelation has focused on making the bag as lightweight as possible. That said, the Nexus is surprisingly strong – thanks to an injection moulded base tray. It’s comfortable to use – the four wheels glide smoothly and the retractable handle is nice and tactile. There are also handles on the side and at the top of the case, so you can grab it and go without difficulty. One of the big benefits of travelling with a soft shell case like the Nexus D is the fact that it has pockets. This can be invaluable if you are only travelling with one item of luggage, as you don’t have to open the whole case every time you want to get items like your travel documents out. We’re not huge fans of the large branding on the front, but it’s a small price to pay when you look at the Nexus D’s overall specs and excellent value. Internally, there is a mesh pocket, as well as elasticated packing straps to help you keep all your items neat and tidy while you are on the go. The patterned lining makes a nice statement – though obviously, it’s not going to be seen by most. Pros: External pocket and additional handles – practical design. Excellent value. Cons: Shows signs of use quite quickly. Spark is Samsonite’s best-selling soft suitcase. This generation has been redesigned to provide extra volume at a lighter weight. The Samsonite Spark’s one of the best cabin luggage options if you want a soft-shell suitcase that is light, portable and long-lasting. The 600 denier polyester exterior comes in a range of four colours. The case is also expandable – which is particularly useful if you need a bit of extra space but still want to bring your luggage on board with you. Soft side cases do tend to hold more than their hard-shell comparators and the Spark is no exception, with a capacity of 48.5 litres. Definitely something to bear in mind if you want to travel carry on only for longer trips. here are handles on the top, bottom and side of the case – a nice touch that comes in handy during transportation. The same thing goes for the top and front pockets – being able to access travel documents and necessities quickly is much more practical when you don’t have to open the whole case to access them. Pros: Large capacity for its size. Expandable. Good value. Dimensions: 55 x 40 x 20 cm, 55 x 40 x 23 cm when expanded. Herschel Novel Duffle is the perfect option for those who are travelling light and want luggage that will provide maximum flexibility. The duffle comes with two strong carrying handles as well as a removable shoulder strap. Classy, classic and understated – it’s been designed for maximum durability without sacrificing any style. We’re the first to admit that a duffle isn’t a practical option if you are carrying heavy items. However, their lack of structure makes them perfect for fitting into smaller or more awkward spaces – a real bonus when you are trying to find space in the overhead lockers. Duffles can get a bit jumbled as you are travelling – but Herschel’s handy shoe compartment goes a long way to helping you keep your items in pristine shape. You should be aware that at maximum capacity, the Herschel Novel will be slightly too large to bring on as carry on. The most obvious workaround for this is not to fill it to capacity. That’s going to be tough if you are away for longer than a weekend as the capacity is only 39 litres anyway. Herschel Novel Duffle is a good option for short weekend trips but isn’t the most practical option for travelling long term. Pros: Easy to transport. Flexible. Stylish. Cons: Not suitable for heavier items. Slightly larger than cabin dimensions when full. Aerolite Super Lightweight ABS Hard Shell is the case for you. The sleek and professional exterior comes in one of three colours: understated black and grey or a bright blue for those looking for something a little bit more colourful. The four-wheeled case is very portable – the wheels glide smoothly and the carry handle is reasonably comfortable for wheeling for longer periods of time. The ABS Shell withstands the usual knocks and bangs of travel without showing any signs of wear. Capacity wise, there are carry on cases with better numbers – but the Aerolite’s 33 litres is more than adequate for a weekend away – longer if you pack smart and use packing cubes. The biggest draw is the price – £26.99 at the time of writing. That makes it a tiny fraction of the cost of some of the other cases on this list. It even comes with a five-year guarantee. Aerolite Super Lightweight ABS Hard Shell. You can see why this is one of Amazon’s best-selling carry on suitcases. Pros: Low price. Looks good. Excellent value. Osprey Ozone 36 converts from a suitcase to a travel pack in a flash – meaning wheels, and a handle for ease of transport, with padded shoulder straps for maximum flexibility. Osprey is one of the leading manufacturers of travel gear -, particularly backpacks. So it’s safe to say that they know what they’re doing when it comes to creating lightweight luggage that is tough and durable. The Ozone 36 is no exception. With an ultralight frame, the ABS polymer plastic exterior is ready for pretty much any challenge you can throw at it as you travel from A to B. One of the real standout features of the Ozone 36 is the well-thought-out storage options inside. The standard front panel pocket is accompanied by a number of inside pockets to help keep your luggage tidy. There’s also an internal compression strap to help you make use of the space as efficiently as possible. The T-shapes handle is ergonomically designed and one of the most comfortable we tested. Osprey Ozone 36 also shines. Weighing a tiny 1.84kg, you get to use your carry on luggage allowance on the things that count. Pros: Extra lightweight. Practical design for maximum flexibility. Tough and durable. Lock: None: lockable zippers . Osprey Farpoint 40 is the perfect carry on travel backpack. Why? It’s light, it’s tough and it’s durable but is spacious enough to cover pretty much any trip. As travel bags go, the Farpoint 40 is one of our favourites. Small enough to be used as a day pack if necessary, it’s well-designed to make use of every inch of available space. It’s one of the most comfortable backpacks you will find. Cushioned carry handles and straps prevent any digging or sore points, while the ventilated back panel allows air circulation as you carry it around. Like the Ozone 36 above, the Farpoint 40 comes with a number of handy internal pockets for storing items as you travel (including a useful laptop sleeve). There’s also a compression strap to help you pack smart and maximise the space available. The lockable zipper for the main compartment is a smart anti-theft feature – so it’s pretty much as secure as a case would be. The Farpoint 40’s unstructured exterior allows for maximum flexibility. So you can poach the small spot in the overhead locker but still have 40 liters of capacity to work with. Looking for more travel luggage reviews? Read The Best Convertible Backpacks.